Reserve a few of the best blackberries for garnish. Put the rest in a bowl, crush slightly and mix in 2 tbsp of the sugar and the lemon zest. Leave in a cool place for 2 hours, to macerate. Put the biscuits in a clean plastic bag and use a rolling pin to bash them into rough crumbs. Do not pulverise them; you want them quite chunky. Beat the cream cheese with the remaining sugar until soft and smooth. Beat the egg white until it forms firm peaks and fold into the cream cheese mixture. Beat the cream until stiff then fold this into the cream cheese mixture. 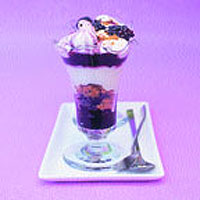 Put a spoonful of the macerated blackberries in the base of four tall sundae glasses. Add a spoonful of crushed ginger nuts, then a couple of spoonfuls of the cream cheese mixture. Keep going until the glasses are full, then garnish with the blackberries and crumbs of ginger nut or a few fronds of lemon zest. This recipe contains raw egg white, so is unsuitable for pregnant women, small children, the elderly and infirm.